The primary role of a rooting hormone is to promote root formation. They also act as natural prevention against bacteria and fungi. 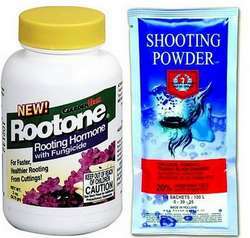 You can use rooting hormone in powder, gel or liquid from. Continue reading below on how to make your own natural rooting hormone recipes based on Willow water, honey, cinnamon, Aloe Vera and aspirin. I have found cinnamon as the best homemade rooting hormone. Make your own rooting hormone at home from Willow water, honey, cinnamon, aloe Vera and aspirin. Rooting hormone, also known as phytohormones are necessary when you want to propagate house plants, tropical plants, orchids and trees from cuttings and to dramatically increase the success of grafted plants. The cuttings of many plants can form roots if placed under the appropriate environmental conditions. Some plants like money plant develops roots when kept in water. However, many of the plant species can be encouraged to form roots with the use of certain growth regulators, known as rooting hormone which stimulate the formation of roots. Rooting hormone were discovered in the 1930s by Dutch scientists. They regulate plant's growth and shape, flowers, leaves and fruits. These are naturally produced within plants. Fungi and bacteria produce very similar chemicals that can also affect plant growth. Rooting hormone is effective on a variety of cuttings for quick root formation, including new growth, aged stems, woody stems and brittle stems. I have used homemade organic rooting hormone for propagating blueberry from cuttings, propagating Arabian jasmine, propagating roses from cuttings, crotons propagation, hydrangeas propagation, Curry leaf plant propagation, Rubber plant propagation, growing Spanish Jasmine from cuttings, Bougainvillea propagation from cuttings, growing magnolia from cuttinhgs, growing pomegranate from cuttings, propagating bougainvillea from stem, growing neem tree, etc. The commercial rooting hormones are composed of chemicals auxins. The main ingredient of the hormone is auxin, a chemical IBA (Indole-3-butyric acid). IAA (indoleacetic acid) is a naturally occurring auxin, but is not used as it is unstable. NAA (naphthaleneacetic acid) is also used sometimes, but is less effective than IBA. The IBA ( chemical formula C12H13NO2) is a plant hormone in the auxin family which can be used in a powder, liquid or gel form. It can be applied either to the cut tip of the cutting or as a foliage spray. The commercially available products are a blend of nutrients, vitamins and minerals to promote root development and prevent disease. They also seal and protects the cutting while encourage root development. Some of the commercial products for rooting hormone powder and cloning gel are Clonex, Hormodin, Rootone, Quick-dip, TakeRoot rooting hormone and Jiffy-Grow. The rooting hormone comes in powder, gel and solution form. The powder and gel form of IBA can be used by home gardener, while the liquid form is used by commercial grower. Rooting hormone is a hazardous material. So check the label to make sure that it is safe for food plants. Avoid contact with eyes and skin. There are some alternatives to the commercially available rooting hormone . The natural rooting hormone are garden safe. Rooting hormone can be made naturally. DIY Make your own rooting hormone using ingredients like Willow water, honey, cinnamon and aspirin at home. These are the best options for rooting hormones. Willow bark contains natural plant growth hormone which can be used for rooting new cuttings. Willow and other Salix species contain indolebutyric acid (IBA) and Salicylic acid (SA). Indolebutyric acid (IBA), the plant hormone that stimulates root growth is present in high concentrations in the growing tips of willow branches. By using the actively growing parts of a willow branch, cutting them, and soaking them in water, you can get significant quantities of IBA. Salicylic acid (SA) is a plant hormone which is involved in triggering the plant's internal defences when there is an attack on one part of the plant. It helps plants to fight off infection by bacteria and fungi which is the biggest threat to cuttings to be propagated. Salicylic acid is therefore in use as a rooting agent for many many years. How to Use Willow To Make a Rooting Hormone? It is used to make Willow Water which contain both the SA and IBA. Collect one year old twigs and stems of Willow (any Salix species). Remove all the leaves and cut the twigs into 1" (2.5 cm) long pieces. 2 inch pieces of willow bark can also be taken. Soak the twigs in a few inches of water for 2-3 days or soak in boiling water and allow to stand overnight. Remove the twigs. The liquid is now ready to use for rooting cuttings. Put the liquid (willow water) in an air-tight bottle and store it in refrigerator. You can use this liquid for two months. Use the willow water to soak cuttings for 12 hours, or use it to water newly started cuttings. Note that this method is not standardized as to the strength of the willow water, the number of twigs, and the exact time that the twigs should be soaked. But still this liquid can be tried that will help your plants root. Honey is a natural fungicide and antibiotic. It can also be helpful as a rooting agent, although it does not contain any hormone to encourage roots, but it contains antibacterial properties as well as the enzymes that help form rooting and protect the cuttings from rotting from fungi and bacteria. It is a garden safe rooting hormone. Because saliva is an antiseptic, some people say that literally licking the cutting end before planting has similar effect as honey tea. Some people have reported success using aspirin as a rooting agent. Dissolve an aspirin tablet in 1 cup of water to make an aspirin rooting hormone, then soak the end of the cutting in the water for several hours before planting. I have tried only the honey and rooting hormone powder for my cuttings to propagate blueberries, roses, azaleas, etc. The licking of the cuttings may leave burning and other taste effects on your tongue, so I don't recommend this method. As cinnamon has antibacterial properties and may act as a rooting hormone, it can be used to protect the stem cuttings during the rooting process from fungi and decay. Just dip the cut end of the cutting in a dilute solution of cinnamon. OR sprinkle a pinch of cinnamon powder into the hole before inserting the cutting. You can make your own cloning gel for plant propagation by using aloe vera. Aloe vera contains Salicylic acid along with other beneficial compounds. You can make Aloe vera rooting hormone for your plant cuttings. Use fresh Aloe Vera gel found inside the Aloe Vera leaves, or you can use Aloe Vera powder for cloning plants. I just cut a thick Aloe leaf from my Aloe Vera plant and move the clone end over the gel before inserting in the rooting media. You can buy aloe powder from health food store. Take some of this powder and mix with water to form a gel and use it for cloning. You can make your own rooting hormone using the above mentioned natural ingredients. How to Safely use chemical based plant growth hormone? The commercial hormone contain chemicals such as Indol-3-yl-Butric Acid with 1-Naphthylacetic acid (IBA and NAA), in addition to a synthetic chemical fungicide. You should take proper care when using them as given below. Work with plant hormone in a good ventilated area so you do not breathe in chemical fungicide in the rooting hormone powder. Keep hormone solutions away from flames. Avoid inhaling the rooting hormone powder or solution. Wear rubber gloves and face mask during use. Wash clothing so they don't come in contact with food. Take only a small quantity to use, 5-10 minutes in advance. Do not reuse the leftover hormone and do not put it back into the bottle. Wash hands and face thoroughly after using plant hormone. Keep hormone bottle closed and refrigerated when not in use. Do not store in the same fridge as food. If you touch it accidentally, wash immediately with water. how does honey and aspirin actually help? tnx these tips were helpful as i live in a remote area where rooting hormone is not available. Honey is an amino acid and aspirin contains Salicylic acid, both are helpful in rooting. I have used honey with success. Marktet Honey is ok for make root hormone? Aspirin water is best for make root hormone for stem cutting? Yes, you can use honey from market for rooting. I have not used aspirin to make root hormone, but there are reports. What is best for root hormone in Honey or Aspirin water? Many people have used honey. You can spit instead of licking, if you want to try that method. I thought about aspirin before reading this post. Aspirin was developed from willow, originally, so possibly it has some of the qualities that would encourage rooting. Honey is a mixture of sugars (not amino acids) as well as hydrogen peroxide, flavonoids & phenolic acid. Those last 3 do inhibit antimicrobial growth. (reference: http://link.springer.com/article/10.1007/BF02768748#page-1) Asperin contains acetylsalicylic acid which is a derivative salicylic acid found in willow. Both exhibit antimicrobial properties. Neither contains rooting hormones (stimulators). So Honey and Asperin does not work like rooting hormones? They actually do not have plant growth hormones, but because of their antibacterial properties, help in rooting by preventing the cutting from rotting. However, they do not promote rooting. Greetings from Northern Maine: Very interesting information regarding cloning blueberries. Has anyone used Clonex rooting hormone with blueberries? I want to try clones a few blueberry plants this coming spring..... any suggestions? Any rooting hormone can be used for cloning blueberries, Clonex should also work. I have used different rooting hormone for propagating blueberries by cuttings. I live in Goa on the Western coast of India.Could you suggest Salix species other than the Willow that I could find locally to extract the rooting hormone ?